Why swipe right when you can right-click?  Okay, so there’s no swiping in Gmail unless you’re using your phone or tablet, but I bet you didn’t know there was right-click either. 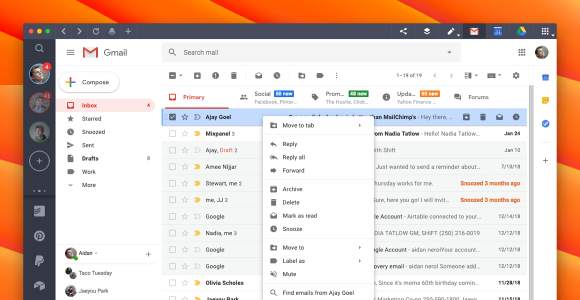 Surprise, the folks at Google just unveiled Gmail’s right-click menu update and it’s about to blow your mind. Or, at the very least, we’re about to make you use the oft-neglected bottom right-hand corner of your trackpad. In the tech world, those two things might as well be the same thing. 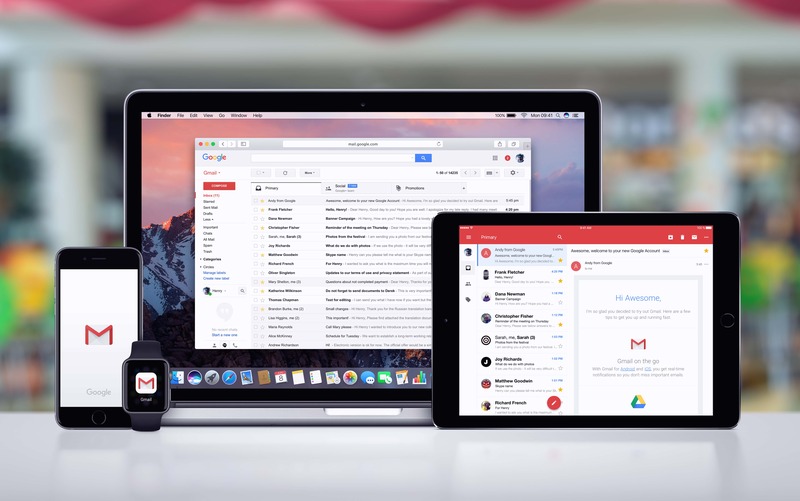 Since Google announced that it was phasing out its Inbox service to focus solely on Gmail, Gmail has been reaping the benefits. In other words, most of what you could do in Inbox, you can now do in Gmail. On top of that, they’ve also been adding extra features such as the preview pane, read receipts, and email delegation. They’re also in the process of porting over the bundles feature. That being said, one of the coolest Gmail features there is might have always been there. And we just weren’t aware. That feature? Right-clicking. Now, I’ve never felt the need to right-click in Gmail as I’ve never felt the need to copy its source code. I’m willing to bet the rest of the Shift team and you yourself feel the same way. However, now I know what magic lies inside of the right-click, I’m all about it. Look at it this way: You can select all of your emails using the finickity buttons at the top, or you can use it the way you use your computer. Quickly, too. I mean, who transfers files one-by-one anymore? Right-clicking inside of your Gmail inbox opens up a whole world of possibilities. That’s what I like to call the context menu that comes up when you do it: World of Possibilities. If you’re anything like the team here at Shift, you like things organized. You might not be very good at it, but you still might like it to look nice. Inbox Zero is a phrase that gives us chills, we sure love using Gmail labels, and you should get a load of our Slack channels. Basically, we know how important organization is to productivity, and we know we’re not alone in wanting to be productive. Discovering the right-click menu in Gmail was like when Indiana Jones discovers the Holy Grail. But, in this case, the CGI knight was the option to move or snooze emails. Whether you want to do it to one or a group. To know you can organize your inbox by right-clicking definitely takes a weight off of your e-shoulders. It’s super easy an insanely quick, saving you time the way we all know we love to do. 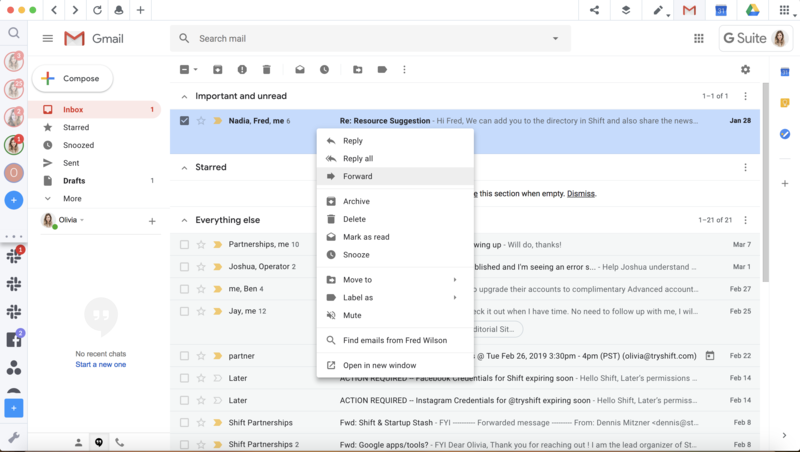 Since Google has added more options to the context menu since they first enabled it, let’s take a look at what you can do directly from your Gmail inbox. Possibly the quickest way of responding to an email since Smart Compose. Simply right-click the email you want to forward or reply to and then click the responding action. Yep, it’s really that easy. Right-clicking on an email in your inbox will give you the option to search for all emails from that sender. Furthermore, if you have “conversation view” turned off, you’ll be able to search for all emails with the same subject line too. Archiving and deleting emails used to require selecting the checkboxes and then clicking the buttons at the top. Now, all you need to do is right-click the email and hit “Archive” or “Delete.” You can also “Mark as read” or “Snooze” an email to read it later.